Peppermint, Pumice & Menthol oh my! Your feet are in for a stimulating treat. 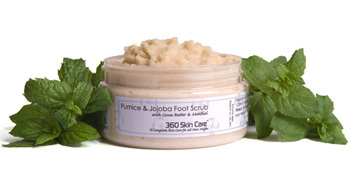 Let 360 Skin Care’s Pumice & Jojoba Foot Scrub inspire and renew your feet with a blend of Jojoba Beads, Pumice Stone and Sea Salt. Formulated to scour away old dead skin that harden your heels to uncover fresh skin cells and restore youth to your feet. Scented with a blend of Mint Oils this foot scrub will have your feet smelling fresh, feeling soft and looking revitalized.